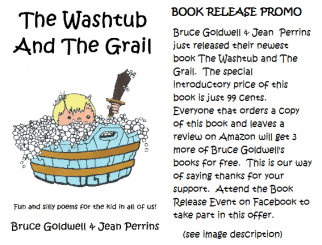 Bruce Goldwell and Jean Perrins just released The Washtub and The Grail on Amazon.com. Goldwell have a book release event on Facebook offering those that buy the new book for 99 cents & leave a review free copies of 3 of his other books. Bloggers, book lovers and others are invited to share Goldwell's book release event on Facebook with their friends and others so that they can take advantage of this offer. Be sure to visit the Facebook event page and CLICK GOING. Information on how to get the 3 free books is available on the event page.